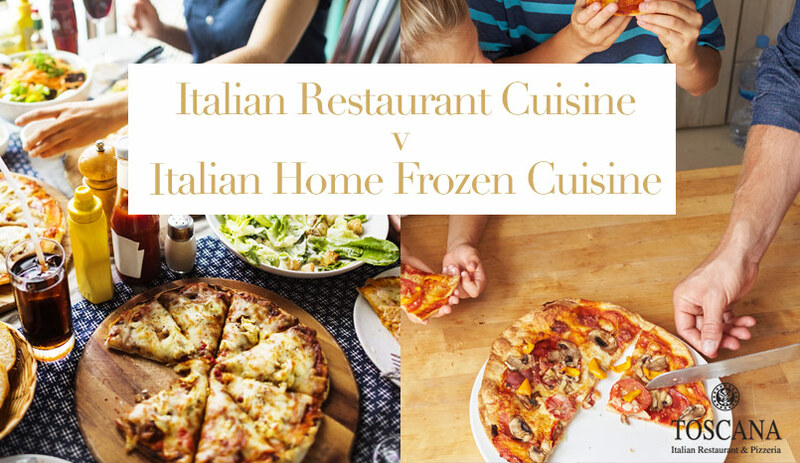 Comparing Italian restaurant cuisine to Italian home frozen cuisine really is a no brainer: restaurant cuisine wins hands down. After all, isn’t that why you spend extra money at a restaurant? True but things are not quite as simple and clear cut as that. Many restaurants buy frozen food as it is cheaper and faster to prepare and you might be surprised to learn that frozen food has some advantages over fresh food. Some frozen foods contain more nutrients than their fresh counterparts. Frozen vegetables and fruits are usually picked at their peak and frozen immediately, thus preserving their nutritional value. Many frozen foods contain only small amounts of fillers and additives. However, in recent years, people have been demanding more fresh, organic foods from their restaurants and the reasons are simple: overall, they are healthier and they taste better. These days people are more aware of the benefits of fresh organic food and the downside of frozen food, and restaurants have responded to this by using fresh ingredients and informing diners about what it is they are eating and where it came from. Many restaurants, including Toscana’s, offer local and seasonal food. So how do you know what you are eating is made of fresh, organic produce? As far as Italian restaurant cuisine goes the evidence is in your senses. Only fresh ingredients have the strong colours we associate with Italian food, strong colours that are an indicator of a healthy dinner. You can also tell by the rich smells of ingredients such as garlic and cheese as well as the soft, warm touch of Italian bread. However, it is in the taste that you can really tell the difference. Genuine, fresh, Italian restaurant cuisine is full of flavour, from juicy tomatoes to lively basil, pepper and garlic to delicious Bolognese. All these aspects are evidence that you are eating authentic, fresh, Italian restaurant cuisine. Basically, frozen food just doesn’t have the same liveliness as fresh produce. 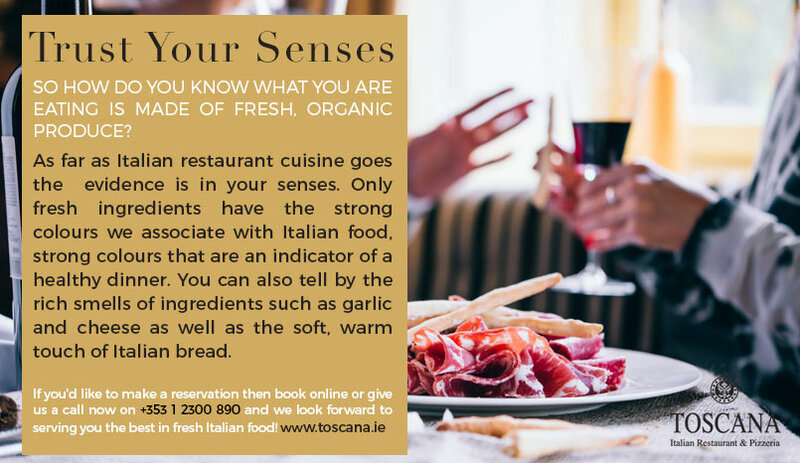 At Toscana’s we know all about the benefits of authentic, fresh, organic ingredients which is why we grow them at our Wicklow garden especially for our Italian cuisine. We offer high quality Irish ingredients combined with authentic Italian recipes to bring you a dining experience that is second to none. Of course, there are other benefits to eating at a restaurant instead of at home. Good service by well-trained waiters is one. A classy environment with a nice ambience is another. At Toscana’s we provide both. If you’re not quite convinced yet, have a look at the reviews section of this site and you will get an idea as to why we consider ourselves to be Ireland’s premier Italian restaurant. 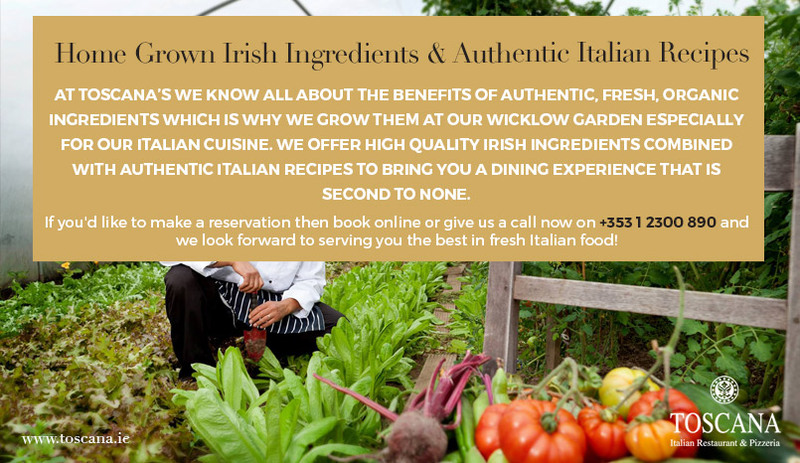 If you’d like to make a reservation then book online or give us a call now on +353 1 2300 890 and we look forward to serving you the best in fresh Italian food!